Heading to OLOCR for NLDS Game 3. Let’s Go Dodgers! I am dressed and ready to head to OLOCR (Our Lady of Chavez Ravine) I got my Mission October shirt, my Sandy Koufax jersey and I will take my Dodger poncho to wear later. I can’t wait to be there! Fernando Valenzuela will be thrown out the first pitch and Sandy Koufax is scheduled to be there tonight and tomorrow night. Steve and I were featured in an article in the La Times today by Hector Becerra. 2013 NLDS: Dodgers vs Braves. Let’s Go Dodgers! I am super excited for this series! The day is finally here! Thursday at 5:30 PM PT at Turner Field. Kershaw 16-9 1.83 ERA will face Medien 15-12 3.11 ERA. I leave work via Metrolink train so when I leave I will have my headphones listening to the game. I should have a “Do Not Disturb” sign. As I am typing this, this co-worker that is a Giant fan is talking to another co-worker telling him “I’ll be rooting for the Braves” then he looks at me doing the tomahawk chant. UGRR I hate that. This morning on the train I open the LA Times and went thru the whole sport section seeing no mention of the Dodgers. Then I kept looking thru the paper until I found this special Dodger Section! LA Times special Dodger playoff section! Afterwards, Lorena noticed that the candle that I lid (right), is the one for Saint Judas Tadeo, el santo de las causas desesperadas The saint of difficult causes. Cartoon by Doug Davis. Amen Mr. Davis. Let’s go Dodgers! Let’s Go! Is it 5:30 yet? I am sporting my Clayton Kershaw t-shirt (women size) underneath a cardigan sweater at work. I have a pair of Dodger earrings on too. 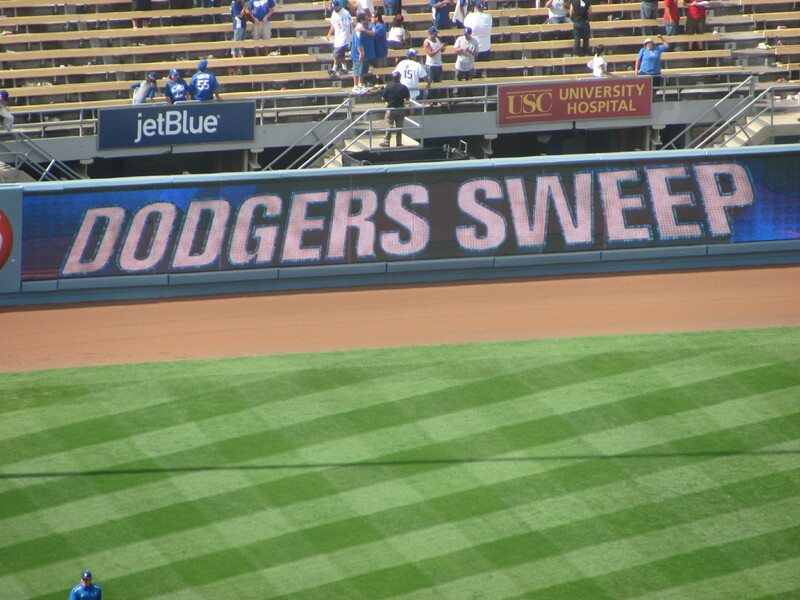 Sunday Dodgers Cornucopia. Rest in peace Joyce Terry. Dodgers lost today 12-0. It was one of those games, no hitting, no pitching, no fielding. There were three errors in the game including one given to Dee Gordon who was celebrating his 24th birthday. I don’t know what the official scorer was looking at because Dee Should not had gotten that error. It should have gone to Billingsley. I like Billz but how could Dee catch that throw? Anyway, let’s put that game behind us. I was showing my brother Vic that Lily is 2-0. He was saying “Lily is 2-0? He just came off the DL!” Then he said in Spanish “Que suerte tienen los que no se bañan” LOL. That means lierary “How lucky are those that don’t take a shower”, It applies to those that without having much “qualities”, Lucky Lady smiles at them and they do well. LOL. Vic said it laughing. Rest in peace Joyce Terry. I was very sad to find out during Opening Week that Joyce Terry, a member of the Top Deck family passed away. My deepest condolences to Carl. 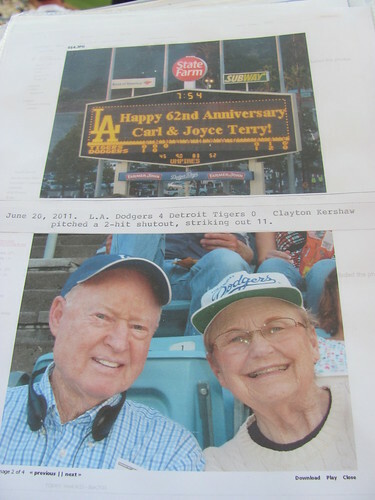 Carl and Terry celebrated their 62nd wedding anniversary at Dodger Stadium last year on June 20, 2011. New York, AZ Summer fall 2011 and 2012 Caravan 001, a photo by crzblue on Flickr. The picture is a picture I took of Carl’s pictures. The inscription says June 20, 2011. LA Dodgers 4, Tigers 0. Clayton Kershaw pitched a 2 hit shutout striking out 11. I will miss seeing Joyce with her pink baseball hat. She was battling cancer but you could not tell seeing her walking down those stairs to her seat. The first time I met Carl and Joyce was at Vero Beach in 2008. We were in the long line at the gift shop when Terry asked me if I had been to the Cardinals Dodger game the day before at Roger Dean Stadium. I said Yes! 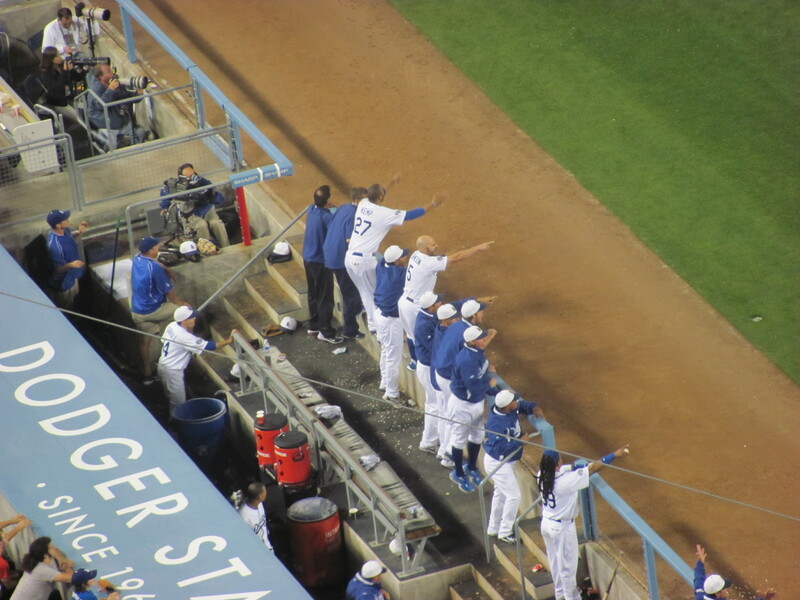 Then he said “Were you waiving a Dodger towel?’ Again I said Yes! We started talking about the Dodgers, where we sit at the Stadium. When I said “I have season tickets in the Top Deck. He said “So do we!” It is a small world. 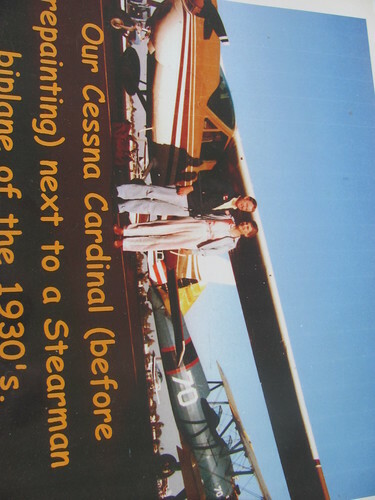 Here is a picture of their plane. They used to travel everywhere. Carl said they had another trip scheduled to Europe this year. It was such a joy watching them together. I can’t flip this picture so is going that way. Rest in peace Joyce. 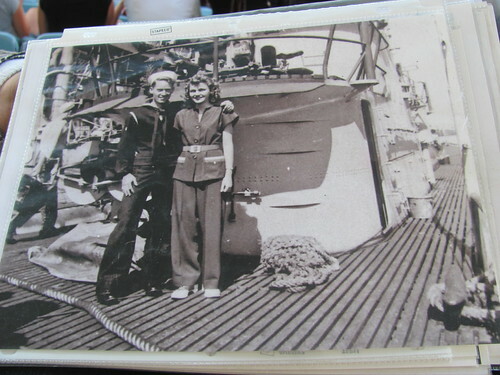 Carl mentioned that Joyce name fitted her because she brought him and everyone else joy. Dodgers came home to the Ravine for a six game home series against the Padres and Cubs after going .500 on the road. They came back with a record of 13 wins and 13 losses for the year and it would have been a loss had Tony Gwynn Jr not saved Broxton’s bacon with a fantastic catch in the outfield. Where Broxton has been frustrating the fans, Andre has been a hitting machine with his 25 game hitting streak. Thought the hardest would have been last night’s Padre lefty pitcher Richards. Congratulations Andre! 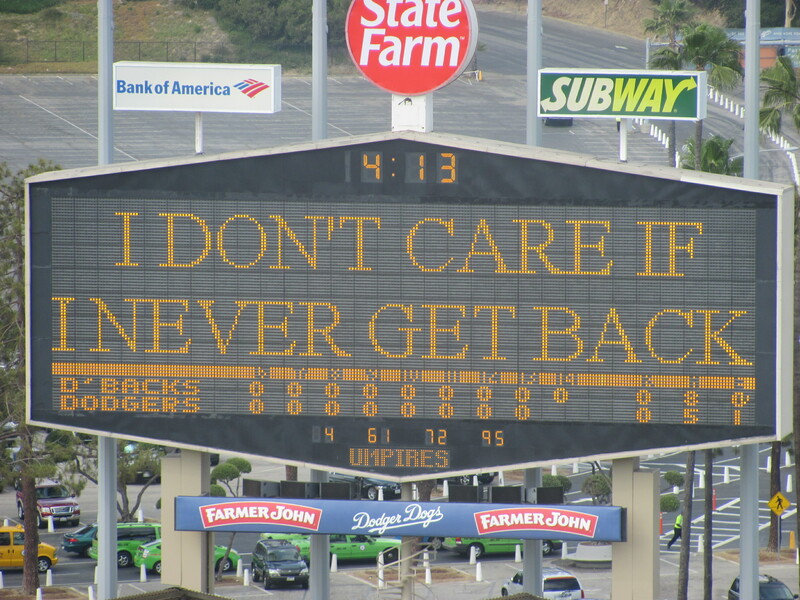 We’ll be at the Ravine cheering on your streak! Hey I noticed the middle sign has changed from Trader Joes to Universal Studios. Here you can see it better with Pau Gasol giving us the Dodgers Code of Conduct. 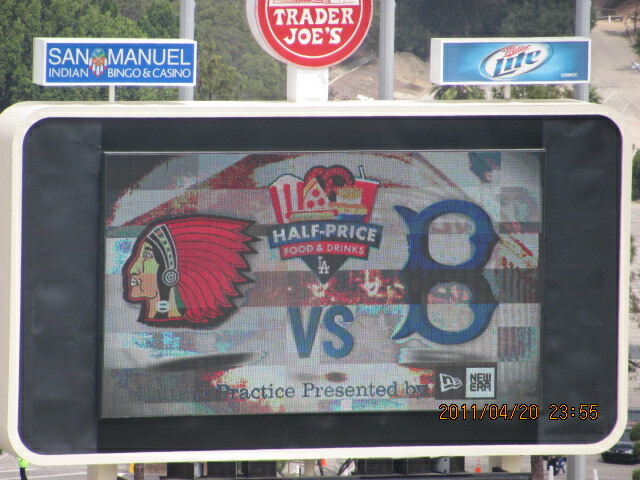 From the last homestand of the throwback game with the Braves, the sign had Trader Joes in the middle. Another throwback game coming up Wednesday with the Cubs. Curious to see the Cubs throwback uniform. In the meantime, is Kuroda on the mound tonight. Go Dodgers! Go Andre!